Desh Bhagat University organised a special programme to pay rich tributes to the great heroes of Indian Freedom Movement. University Chancellor Dr. Zora Singh, Vice Chancellor Dr. Virinder Singh along with staff and students remembered the great sacrifices made by the patriots during freedom struggle. 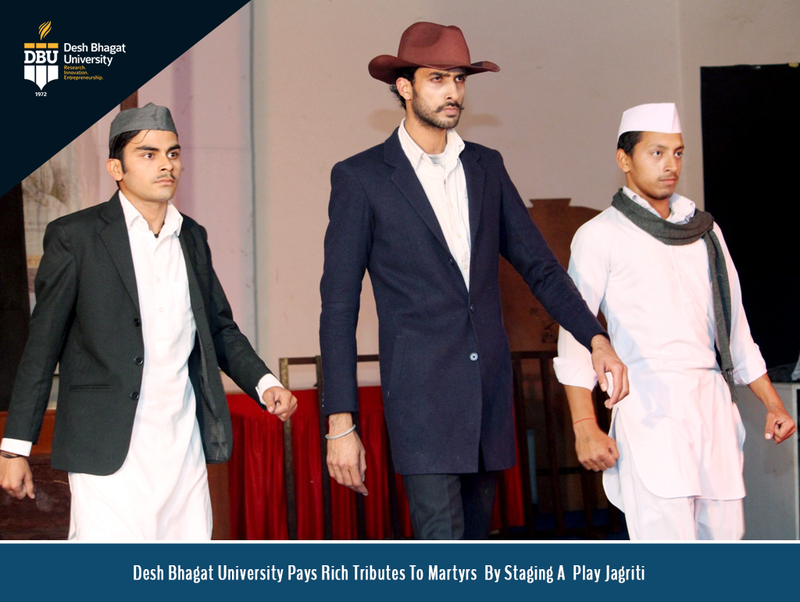 On this occasion, A play Jagriti was performed by Adi Manch Theater Group Ambala, which was based on the martyrdom of Sardar Bhagat Singh, Rajguru and Sukhdev. 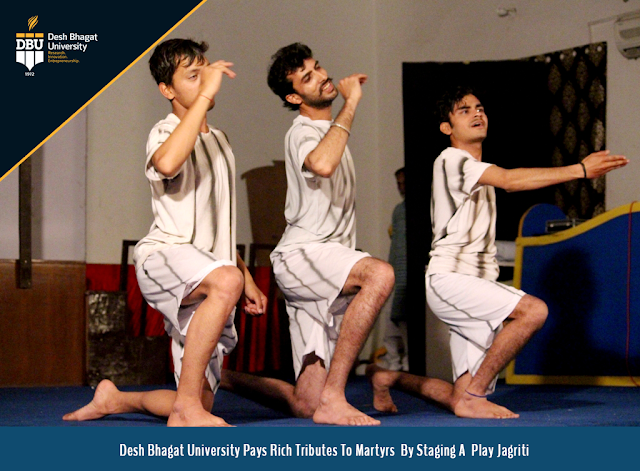 The play highlighted various aspects of the life of these martyers, who struggled hard to free their motherland from the British rule. The artists beautifully performed their character that inculcated patriotism, dedication and love for motherland among the students. Earlier, the function started with paying floral tribute to all martyrs of Indian freedom struggle. 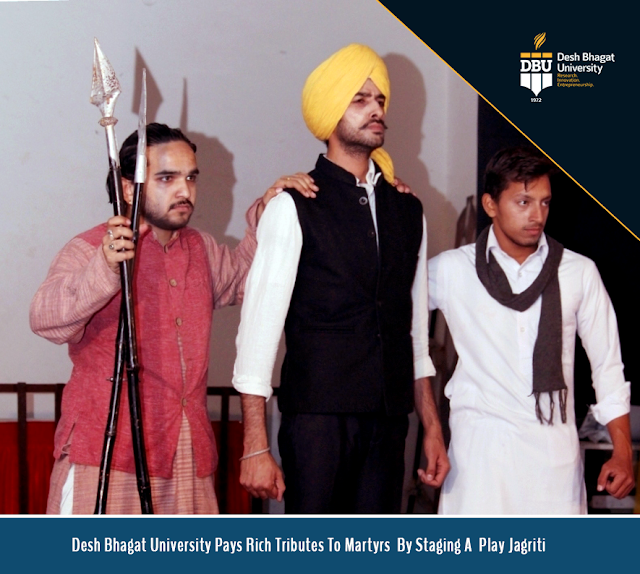 While speaking on the occasion, Chancellor Dr. Zora Singh urged the students to inbibe the spirit of dedication, duty and patriotism towards the country from the life of the martyrs who fought for the freedom of the country till their last breath. Director of the play Rahul Sharma described that the play Jagriti is adopted from the play Gagan Damama Baajyo written by Piyush Mishra. The artists who performed in the play was Deepak Vij as Bhagat Singh, Sumit Makkar as Rajguru, Ankur as Sukhdev, Shiv Malik as Chander Shekhar Azad, Monika as Vidyavati, Jagdish Dhiman as Lawyer, Naresh Sharma as Judge, child artist Vardaan, Devans, Vanash, Madhav, Atharav, Taran and Yaman. Music of the play was given by Rahul Verma and Lighting by Yogesh jangra. 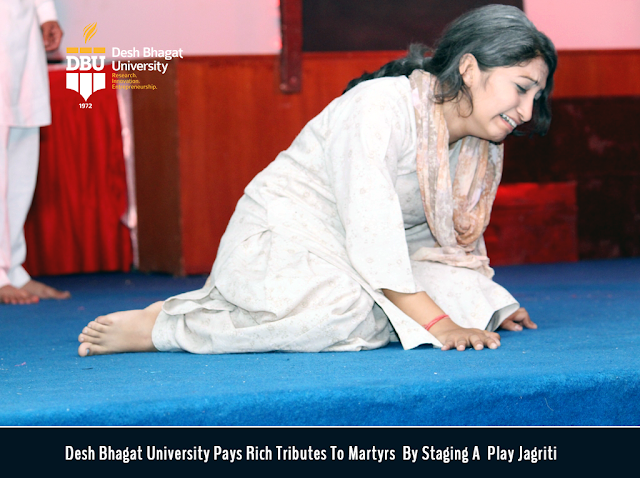 Pro-Chancellor Dr. Tajinder Kaur appreciated the performance of each and every artist of the play. The life of these martyrs is a story of supreme sacrifice and is very close to the hearts of the people, she added.